At one point online marketing was just a new and different way to market. It opened up a new form of media on which to peddle goods and services. But within just the past few years, the importance of digital marketing has become something else. It’s become an integral part of what a business is to its customers. As the Internet becomes entwined with everything we do, the importance of digital marketing is becoming crystal clear. In 2018, the average Internet user has at least 7 social media accounts. That’s up from 3 just 5 years ago. 97% of US adults under 65 are on social media at least once a month. The vast majority are on it every day. Social media is strongly preferred as a means of customer care. Although as many as 89% of customer messages are ignored by businesses. 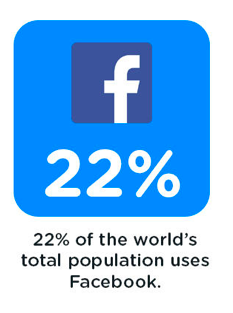 22% of the world population is on Facebook. 62% of people in the US are there. 76% of Facebook users and 51% of Instagram users are on it every day. 30% of people on social media mention a specific brand when referring to milestones in their lives. Gen X is slightly more likely to interact with a brand on social media than millennials. The trend right now is the average person spends over 2 hours a day on social media. Teenagers average 9 hours. Social media is integrated into everything they do from school, to work, to entertainment, to hanging out with friends. One of the top 10 reasons people say they’re on social media is to buy products advertised to them. They spend around 37% of their social media time interacting with branded content. 57% of Millennials say that social media has made the ads they see more relevant to them. 48% of people say they made their last online purchase as the direct result of a Facebook ad. Social media marketing and advertising are only a piece of digital marketing. But it’s a very important one. Throughout this article, we’ll look at many kinds of online marketing methods. This will show the importance of digital marketing to your business. You’ve seen it happen before. A huge company like Walmart comes to town and wipes out 100’s of local specialty shops. Starbucks rolls in and mom and pop coffee and bagel shops close down. We’ve seen the online equivalent of this with Amazon. It’s hard to compete with the name recognition or the millions that they put into marketing and reputation management. That’s where the importance of digital marketing shines as a beacon of hope for small businesses. It’s the same for brick & mortar, ecommerce, and personal brands alike. Digital marketing actually allows smaller businesses the ability to hold a top ranking position, like a client we helped outrank Amazon and Lowe’s using our AdWords services. Digital marketing allows small businesses to compete with a much smaller advertising budget. When managed effectively, it gives them laser-focused control over where and how they spend their money. When you have this kind of control and the data to support decisions, you make smarter ones. Continue to explore the benefits and importance of digital marketing. Just how it levels the playing field becomes increasingly clear. When you run a magazine ad, for example, you definitely do some targeting. You know if your target audience reads that publication. You have some control over placement and size. You control the message within certain publisher guidelines. That ad may reach 1 million plus readers. But what percent of this million is actually your target? A particular fashion magazine might have a demographic 59% female ages 35-55. They may have some college education. And you know they’re interested in the type of fashion depicted in the magazine. But that’s a huge demographic. One of the gifts that digital marketing has given us is the ability to dissect huge demographics. Whittle them down into very targeted groups to get super-focused on a specific kind of person. Who’s that person? It’s the person most likely purchase what you sell. When you do targeting at this level, you create an ad that’s highly relevant to your target market. Because it’s so relevant, it connects on a level that more general advertising can’t. This connection gives it the ability to influence decisions. You do it without annoying traditional advertising techniques. You’re not showing the same ad thousands of times over a month’s period. Or interrupting someone’s program over and over. So, what kind of targeting is possible with digital marketing? You’ll probably be surprised. Let’s look at search advertising as an example. That includes AdWords. In this form of digital marketing, you target people doing searches in Google. Search results now account for about 64% of website traffic across the Internet. For businesses who’ve put strong focus on SEO (search engine optimization) as much as 80% of traffic arrives from search results. Search advertising, aka PPC (pay per click) allows you to position yourself near the top of searches. That’s even if that’s not where your website would organically appear. Do this by bidding on search queries that represent these specific targets. Build ads and landing pages around them to convert that traffic. Social media advertising similarly allows you to narrow your target audience Use the data they’ve collected about their users. Tell Facebook, for example, to only show your ad to people with a very specific recent behavior, interest, location or other identifier. You don’t spend thousands on one ad. And you can run ads indefinitely. So you can easily modify that ad to connect with different groups of people. You don’t have this level of control over who sees your ad with any other form of marketing. We’ve only just begun to discuss the importance of digital marketing in regards to targeting. With email marketing, yet another important part of digital marketing, you can target almost down to the individual level. In some cases, you actually can get to the individual level. Marketers call this “personalization“. But when you send them content that is highly relevant, they stay on your list and continue to buy again and again. You can see where in the importance of digital marketing lies in a repeat lifetime customer. There are basic programs that will allow you to add a person’s name or certain information automatically to an email. But we’re talking about a much more advanced approach that’s proven its ability to get results for our clients, like the improvements in the chart below. That’s email segmentation, automation, and personalization. With segmentation, you’re collecting data about each email subscriber. You use this data to sub-divide your list based upon certain traits or behaviors identified through analytics. Once, divided, send each segment content that is most relevant to that segment. If it isn’t relevant, you don’t send it to them. And if you can make small changes to a piece of content make to it more relevant to a different segment, you do it to reach more people. Automation allows you to send that content at the optimal time to obtain the desired result. It takes the repetitiveness out of the process. You learn what this optimal time is through your data collection process. This time may be immediately. It may be a certain time of day. It may be sending a certain message before another one. Finally, you have personalization. You recognize a person on an individual level. You are able to recommend the best products to them because you know their purchase history. You recognize that they just visited your website and abandoned their cart. You refer to them by name. They feel that you respect their individuality. While these are 3 different things, when they work together they get results. According to MailChimp’s extensive data, subscribers are 14% more likely to open emails that are segmented. They’re 101% more likely to click a call to action in the email. Segmentation reduces bounce rates by 5%. That’s a lot in email marketing. It reduces unsubscription rate by around 10%. But what about sales and revenues? Segmentation sounds like a lot of work. Does it have an ROI to justify it? Aberdeen Research Firm found that conversion rates increase by 10% with segmentation. But not only are conversion rates higher. People receiving segmented emails spend more. Marketers saw a 760% increase in revenues thanks to segmentation. Businesses who use automation to send these emails at the optimal time on average increase their conversion rates by 50%. Automated emails are 70% more likely to get opened and have 50% higher click-through rates. A study found that businesses who use automation are 133% more likely to send out highly relevant content. In a typical email campaign, 75% of revenues are drawn from the segmented portion of the campaign. The rest comes from general emails. It’s this relevance that gets these kinds of results and further proves the importance of digital marketing to a business. 81% of people who get an email that’s personalized based on past purchases buy again. But segmentation and automation aren’t something that just any small business can do on their own. These do take an investment in advanced tools that take a lot of the monotonous, repetitive and time-consuming work out of the process. These programs are essential for running effective segmentation. But they’re often cost-prohibitive for a small business. This is yet one more benefit of working with a digital marketing company. It can carry the costs while allowing you to benefit from these state-of-the-art technologies. Increasingly, businesses that succeed are using segmentation, automation, and personalization to do so. What do you really know about how a TV ad performed? You can determine best times for the ad to air and best frequency if you do some testing. You might create a focus group to drill down on the data. But generally, you only know its reach according to the agency and whether it increased buzz, sales, or met a similar marketing goal. Now, let’s look at the importance of digital marketing in comparison. Whether they actually saw it. With TV ads, you don’t even know that much. They could have been in the kitchen or had the TV on mute. All of this is pretty easy to track with free analytics software like Google Analytics. Or you can gain even more insight with paid tools. Use what you learn to cut costs where you aren’t seeing a return on investment. Increase spend and efforts where you get the best results. Continue to streamline your campaigns to optimize your results. You may still decide to shell out some money for traditional marketing. Many businesses like to have a mix in their marketing plan. In that case, the importance of digital marketing is how much you learn about who your customers are that carries over to other marketing methods. As with any marketing, there’s initial investment required to get traffic flowing. But the importance of digital marketing to small businesses becomes very clear when you see how easy it is to scale and adapt as your business grows. For example, with social media campaigns, display ads and search ads you can choose a daily budget. You know exactly how much that campaign will cost you. Now you begin to see amazing results. You don’t have to go in and renegotiate an ad spot to keep the ad running. Your ad continues uninterrupted. As you continue to convert that traffic, you just increase your daily spend and revenues with it. If you got a massive order in from a customer and need to scale back to avoid getting backlogged, it’s just as easy to do that. If something isn’t working in your marketing, you don’t have to wait for the ad contract to run out. You don’t have to start from scratch. You’ve got the power. Just make that small change and re-launch the ad. The importance of digital marketing lies in the fact that you can get instant results. Analyze data and make changes fast to reduce wasted ad spend and lost revenues. This leads us to just how cost-effective digital marketing is for a small business. Email marketing has the highest ROI of any marketing method…period. It can get a whopping 3800% return. That’s $38 in revenue for every $1 you spend. About 20% of companies are seeing an ROI of $70 to $1 spent. Email marketing is a conversion machine. But you do need a way to build your email list with quality subscribers. Then deliver highly relevant content to a subscriber’s inbox. This is most often accomplished through a combination of social media marketing and content marketing. But these marketing methods have an impressive ROI of their own. Social media’s ROI can be indirect at times. But a Forbes study found that companies using social media outsell 78% of businesses who don’t use social media. IBM found that a lead that comes in through social media is 7X more likely to become a paying customer. More likely to convert also means you’re spending less money trying to convert people who will never become paying customers. As a small business, cost-effectiveness is your ultimate priority. You have to be able to stretch those dollars as you grow your business. Every dollar you spend matters. You need to know it’s going to provide you an ROI. That’s the importance of digital marketing to small business. 88% of people consider online reviews an important part of the buying decision. 23% of people visit your business after reading a good review. The average American spends over 24 hours a week online. For millennials and gen Z, 10 hours a day is the norm. This includes Internet time at work and school. 47% of millennials and Gen X don’t watch traditional TV. And 22 million people had canceled their cable by the end of last year. Magazine and newspaper sales continue to decline at a rate of about 16% a year. But on the other side of this, over 1 trillion online searches are performed each year. Google holds the monster share with 3.5 billion of these queries. 8 billion videos are watched on Facebook each day, most of them from businesses. From restaurants to doctors to bookkeeping software to commodities, the modern sales process starts online. Whether it’s something a friend shared on social media, the result of a search query, or an email newsletter that they received in their inbox, it all starts here. The more integrated your business is with the customer’s online experience, the most easily you grow your business. You need an online presence to be relevant to the vast majority of customers. The importance of digital marketing is that it gives you that presence. Some paid advertising like AdWords, Instagram or Promoted Tweets. It’s impossible to get found online without some paid media. Reputation management. Know what people are saying about you. Solicit more reviews. When asked to review, most people write a positive review. When not asked, only unhappy people tend to write reviews. Integrated touch points. All of the places that you’re online should work together. Engage your target customers both online and in your physical shop if you’re a brick and mortar business. People are tired of traditional advertising. They learned that they have a choice. 20% of 16 to 34 year olds use an ad blocker online. Overwhelmingly, people flee websites that pop up annoying invites and ads when they first land on the page. They’re choosing to consume media that doesn’t force them to sit through commercials. It seems cliche. But people want respect. They want someone to provide them with information that helps them make informed decisions. They want to buy from brands that value what they value. They want you to be part of their conversations. The importance of digital marketing is that it allows you to market to people in ways that show you respect them and value them as human beings. According to research by IBM, mobile transactions are increasing at the lightning fast speed of 35% year over year. But it’s not just the actual buying and selling happening on mobile. People are increasingly using their mobile phones as a kind of augmented reality layered over a business. They’re looking at reviews and product information while in your store. They may be ordering online or communicating with customer care en route. A selfie they take in your store becomes a promotional opportunity for you. They may write a review for you before they even leave your office. Integrate the mobile experience with the physical experience. As you do, the better your business will take advantage of these opportunities. Send an alert to let someone to let them know something they were interested in is on sale as they walk down that aisle. Use physical store behavior as tracked by their phone (with permission, of course). With it, send more relevant offers. Invite someone to visit the store when geo-location shows that they’re in the area. You get the importance of digital marketing. But that doesn’t make it easy to implement strategies that get you the ROI you’re looking for.